MATERIALS: weight tape, lasercut stainless steel, laths, screws, brackets, wire, hooks. 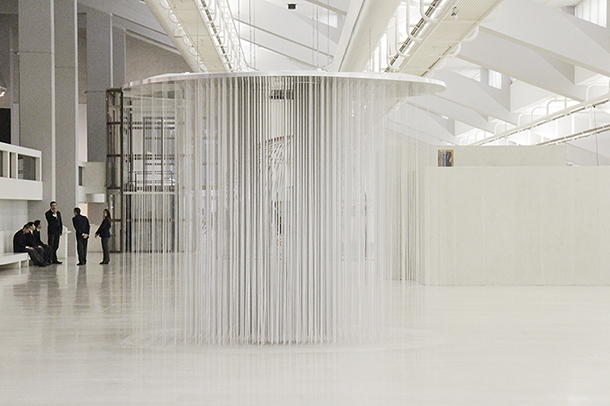 Encircled is a cylindrical installation suspended from the ceiling. 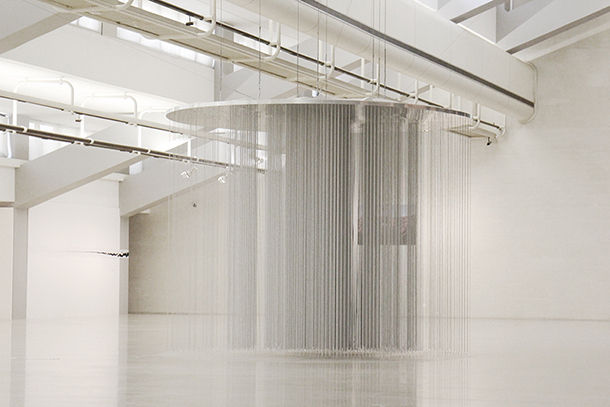 From a circular disc 10000 weight tape strings are hung in a concentric grid structure creating a vertical graphic pattern. When the eyes are parallel to the distribution of the grid one can look across the work. As soon as you move the body/eyes compared to the strings the visual experience changes. Depending on ones positioning towards the work it opens and seals off. Creating visual passages. Derails the perception. One can walk into the work. Because of the weight and the denseness of the strings a strong physical and visual friction can be experienced.